IBPS PO V Allotment List 2016 - IBPS PO CWE V Joining Formalities 2016 for Appointment in Punjab & Sindh Bank - Download IBPS PO V Appointment Letter 2016 - IBPS PO V Final Scorecard Joining Schedule on ibps.in. 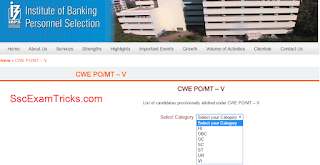 IBPS PO V 2016 Allotment List Available on 30.04.2016: IBPS has uploaded allotment list of candidates (finally selected under IBPS CWE PO V 2016) on 30th April 2016 on website ibps.in. 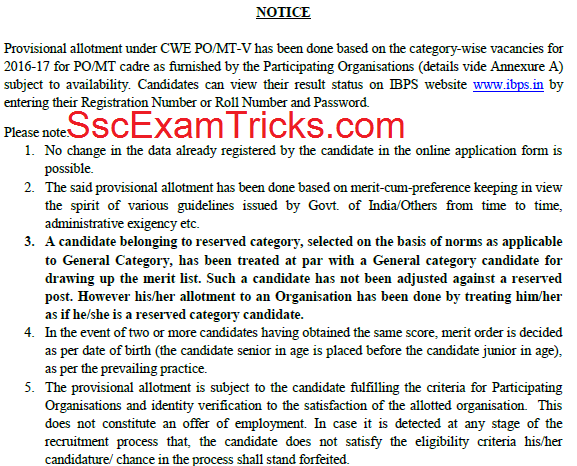 The list of provisionally allotted under IBPS CWE PO V has been published for all states of the country. Those candidates who are waiting for IBPS PO V 2016 Allotment list, they can download their allotment list / allotted station from direct link given here. Punjab & Sindh Bank Joining Formalities under IBPS PO SO V 2016 SWO Released on 30.04.2016: The breaking news is that Punjab and Sindh Bank has uploaded the joining formalities schedule to be organized for Probationary Officer, Specialist Officer Posts under IBPS CWE V 2016. The joining formalities of Punjab and Sindh Bank can be downloaded from direct link given at the bottom of the para. 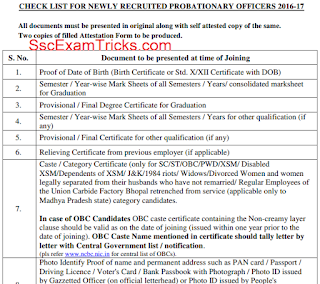 The set of documents required at the time of joining of PO, SO and Single Window Operator (SWO) has been uploaded with joining check list of PO- V, SO-V and SWO- V. A list of formats to be duly filled with agreement (signature in the end) should be submitted at the time of joining for PO, SO & SWO posts. 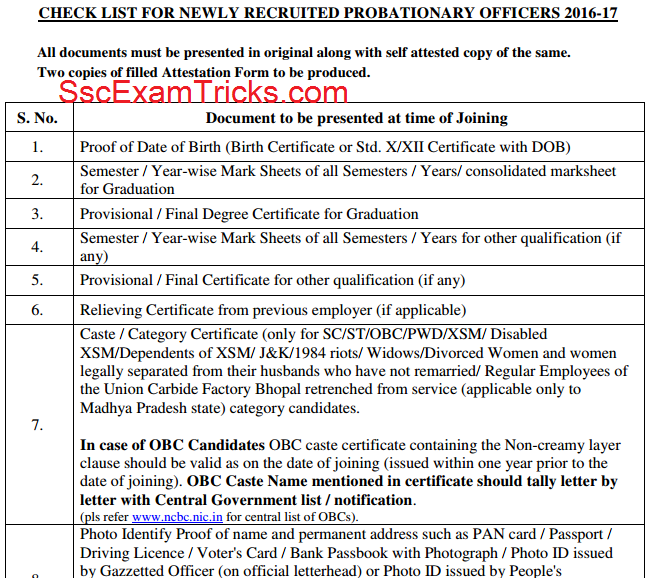 Those candidates who have been selected for IBPS PO SO V & SWO can download their joining formalities from direct link given here. The latest news is that IBPS PO V Joining formalities have been uploaded by the selection board. The Joining formalities will be a document submission process which must be followed by each finally selected candidate to claim against the vacant post published in the bank. The bank allotment has been made by IBPS and now candidates are going to submit photocopies of their original documents in the end of April 2016. It is mandatory to submit all necessary documents including name, IBPS roll number, online pre & main exam call letter of IBPS PO CWE V, KYC formalities (PAN card/ Aadhar card/ Driver’s License, Passport etc), DMC of 10th, 12th & graduation, consolidate graduation certificate, computer literacy certificate, OBC certificate should be issued within one year prior to the date of interview as per notification of IBPS, SC/ ST community certificate and ExS certificate (If applicable). Latest News (01.03.2016): Many Congratulations to All Selected Candidates. IBPS PO V Appointment/ Allotment list has been uploaded now in which station allotment for reporting with joining details has been mentioned. Now, candidates are searching for IBPS PO (main) scorecard 2015. This is the time when IBPS is going to upload the scorecard / marks obtained by the candidates in each section of the main exam. From SscExamTricks.com resources, it is estimated that the scorecard is going to be available within 4-5 days from the result announced by the selection board. It is expected that it will probably be announced on 20th – 21st November 2015 on the official website at www.ibps.in. Those candidates who wish to check their performance in online main exam through marks list; they can download IBPS PO main scorecard/ marks from direct link given here. First, you click on the direct link given here. The link will leave you on the official page of IBPS PO V 2016 Allotment List. Here, select your category (UR/ BC/ ST/ ST/ OC/ VI / HI) from drop down list on this page. The IBPS PO V 2016 Allotment list will be loading and to be downloaded in PDF within a few minutes. Check your name or registration number with allotted bank on this IBPS PO V 2016 Allotment List. The Allotment list also contains marks by the candidates obtained out of 100 marks.